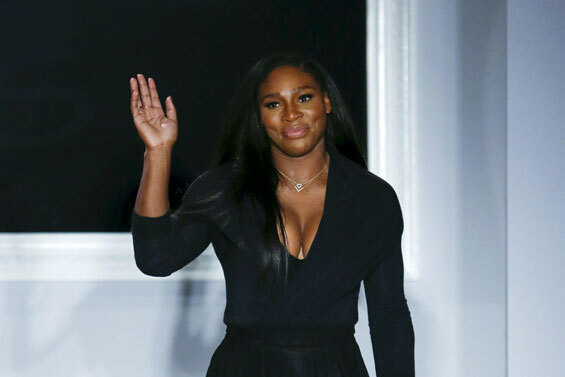 Serena Williams put a brave face on her shock US Open defeat, unveiling her latest fashion collection in New York on Tuesday with Anna Wintour and rumored boyfriend Drake in the front row. The tennis ace, whose dreams of winning a calendar-year Grand Slam were shattered in the US Open semi-finals at Flushing Meadows, looked beautiful in black and gave a bashful smile to cheering fans at the end of the show. Using the same Hell's Kitchen venue where Donatella Versace hosted Rihanna and Naomi Campbell at a celebrity-studded party last season, Williams presented 23 looks - all available for immediate purchase online. The rumor mill went into overdrive over Drake and Williams's relationship status after the Canadian rapper kissed Williams's hand backstage and she used some of his music to accompany the models down the runway. Wintour - the editor-in-chief of Vogue, powerful arbiter of style and huge tennis fan - chatted in the front row to Drake and model-of-the-moment Gigi Hadid. At the end of the show, Wintour politely shook Drake's proffered hand, before being the first to hurry backstage to talk to Williams. 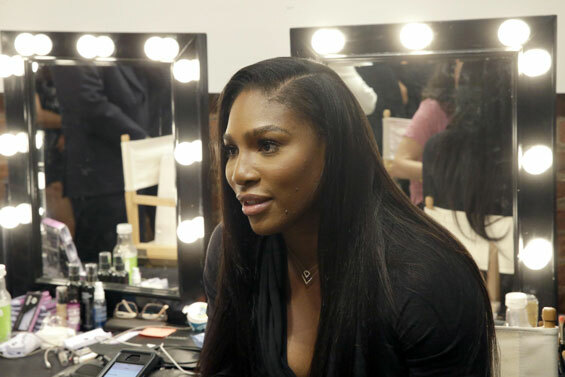 The Serena Williams Signature Statement for retailer HSN was practical, comfortable, affordable and infused with the relaxed, everyday casual vibe one would expect from a sportswoman with a keen eye for style. She made liberal use of fringing - a key look seen in the spring/summer 2016 collections during New York Fashion Week - with asymmetrical-tasseled skirts and tasseled suede jackets. Suede and leather were prominent - in skirts, dresses and cropped jackets, with distressed leather leggings and a black halter evening dress with a leather fringe train. There were multiple long-sleeved tee-shirts made elegant with a cowl neck or draping around the shoulder, along with hooded ponchos and a fringed leather cape. Trousers were tight. There were also printed leggings and micro shorts, and in a nod to fall 2015, leather jackets with a faux fox trim. The color palette included brown, tan, grey, white and black, with splashes of hot pink. Pieces from the collection are on sale at prices ranging from $29.90 for a pair of leggings to $129.90 for a faux shearling jacket. "Throughout my life, I've always believed in pushing boundaries," Williams said in a statement. She said offering the clothes through HSN allowed her to "communicate directly with my fans."